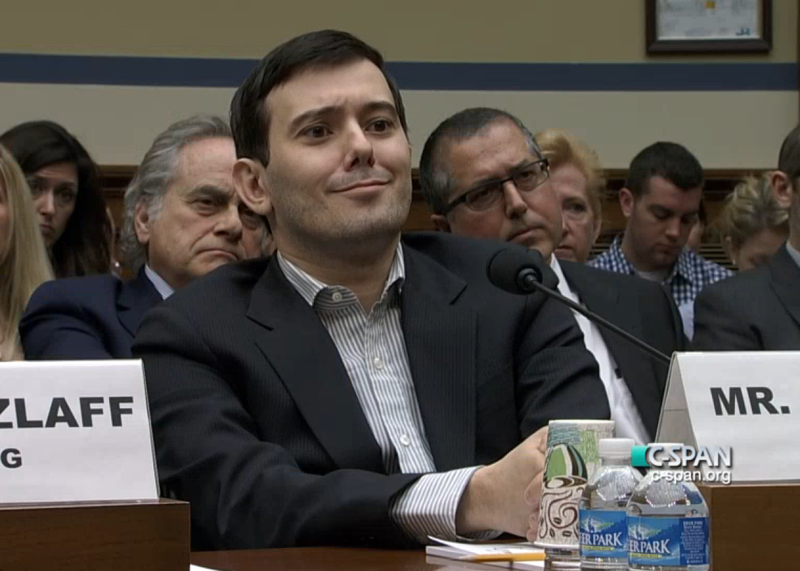 Martin Shkreli trolls congress by refusing to answer questions. Thankfully, facial expressions aren’t incriminating. Welp, Martin Shkreli trolled Congress pretty good Thursday. The former Turing Pharmaceuticals CEO appeared before the House of Representatives’ Oversight and Government Reform Committee Thursday morning for a hearing about prescription drug prices—or, more precisely, about companies like Turing that wring profits out of hospitals, patients, and consumers by massively jacking up the price of old medications. Presumably, the committee members were looking forward to grilling the loquacious arch-villain of the pharma industry in front of C-SPAN’s cameras. But instead, Shkreli stayed mum, smirking while using his pending indictment on charges of securities fraud as an excuse to plead the Fifth in response to all of the committee’s questions, no matter how innocuous. Meanwhile, he largely chose to communicate his disdain for the whole event through facial expression—which, to be fair, was effective. Gowdy: Is it pronounced Shkreli? Gowdy: See there, you can answer some questions. That one didn’t incriminate you. I just want to make sure you understand you are welcome to answer questions and not all of your answers are going to subject you to incrimination. You understand that, don’t you? Shkreli: I intend to follow the advice of my counsel. Not yours. Gowdy: I just want to make sure you’re getting the right advice. You do know that not every disclosure can be subject to a Fifth Amendment assertion. Only those that you reasonably believe that could be used in a criminal prosecution, or could lead to other evidence. Shkreli: I intend to use the advice of my counsel, not yours. Gowdy: Do you also understand that you can waive you Fifth Amendment right? You gave an interview to a television station in New York where, if I understood you correctly, you couldn’t wait to come educate the members of Congress on drug pricing. And this would be a great opportunity to do it. So do you understand you can waive your Fifth Amendment right. Shkreli: On the advice of counsel I invoke my Fifth Amendment privilege against self-incrimination and respectfully decline to answer your question. Godwy: Well, Mr. Chairman, I’m vexed. He’s been willing to answer at least one question this morning. That one didn’t subject him to incrimination. I don’t think he’s under indictment for the subject matter of this hearing so the Fifth Amendment actually doesn’t apply to answers that are not reasonably calculated to subject you to incrimination. And even if it did apply, he’s welcome to waive it. I listened to his interview. And he didn’t have to be prodded to talk during that interview. And he doesn’t have to be prodded to tweet a whole lot or to show us his life on that little webcam he’s got. So this is a great opportunity if you want educate the members of Congress on drug pricing or what you call the fictitious case against you or we can even talk about the purchase of, is it Wu-Tang Clan? Is that the name of the album? The name of the group? Shkreli: On the advice of counsel I invoke my Fifth Amendment right against self-incrimination and respectfully decline to answer your question. Gowdy: Mr. Chairman, I am stunned that a conversation about an album he purchased could possibly subject him to incrimination. As is his wont, Shkreli took to Twitter afterward to share his impressions. I had prior counsel produce a memo on facial expressions during congressional testimony if anyone wants to see it. Interesting precedence.